Earlier in the life of Scrapture, back when it was known as Cultus, players had a hand of cards that were hidden from their opponents. Games I had played and liked did things that way, so I ended up doing it too. What I liked about hands in other games (such as Magic) is that you always had to be thinking about what your opponent had. And similarly, you could hide important information from your opponent or trick them into thinking you had something you didn’t. They also make the game less mechanical and more strategic. After all, if you know everything your opponent has at all times, you should be able to play perfectly. When I decided to try to simplify the game, one of the main components on the chopping block was Influence cards. Influence cards were what player’s hands were comprised of, and while I liked them, they were the easiest thing to cut. They felt supplementary, but in terms of mechanics and theme. With Influence out of the way, my initial instinct was to put Follower cards in their place. Players had to have a hand of cards, after all. Or did they? I asked myself the question. What did the game gain by having a hidden hand? What would happen if hands were open information? In designing Scrapture, one of the biggest challenges has been getting players to interact and care about each other’s board, without resorting to “take-that” style mechanics. When hands were hidden, players tended to ignore each other and build their solitaire engine. If I added attack cards so that players could stop each other, that always felt bad for both the attacker and the victim. When I tested open hands, just the opposite happened. The attack cards were still there, but people didn’t feel bad. They could see everything on the board, which allowed them to play around attacks. Players even felt good about successfully thwarting an attack. And the best part? Players were looking across the board to see what their opponents were doing and adjusting their strategy accordingly! I can’t tell you how good that made me feel after struggling to do just that for so long. The lesson learned here is to challenge the core assumptions about what your game is. Look for those “what if” questions. Think about what each of your mechanics is bringing to the game and how they influence the behavior of your players. How Will Our Rulebook Look Like Compared To Others? Our game, on its own right now, is pretty easy to explain. But there’s a difference between explaining it to someone in person, and that person pulling out the rules from the box and hoping they don’t scratch their heads in confusion and putting the game away forever. Our game has some very unique concepts, so our rulebook has to be as well thought out as the game. The best rulebooks go in-depth and explain every little mechanic about their game. It is chock-full of images, examples, and understandable language that fill the player’s head instantly. Without it, an intense session that goes wrong won’t have the right information to fix it, or have the stuff to get a game going to begin with. I was looking at a few rulebooks, some at Phil’s suggestion and some on my own, to get started on how our rulebook should look like. Here are some that were effective for their games. The strategy territory-building game use a lot of icons that make it easy for the player to remember what is going on. The setup and turn sections are explained plainly and in detail. We’ve played this game before, and it is arguably one of the best rulebooks we’ve seen. After the regular rulebook part is finished, it has all the tiles, agents and lords used in the game, explained and divided by appendices. The beauty in how this Kickstarter-funded game made its rulebook is simple. First, it’s barely a book – just two print-ready pages. Second, most of it is either written in lists to explain order or short blurbs that keep things clear. For all intents and purposes, this game can be very complex at times. So, this is more of an example of how the writers did such a good job in creating a rulebook that made it as made it as accessible as possible. Players have a good start on first page from an image of the player area in the setup page. All the sections have strong headings that pop out and make it easy to find the portion you need. The flavor text throughout is tongue-in-cheek and well placed. Texts are changed in color to get the reader’s attention, whether it be to read about a mechanic of the game, or one of the many examples described throughout the rulebook. What makes this game’s rulebook stand out from the other is that I has a cool map-generation section. From there, players can use the hex tiles to configurations for different styles and numbers of players. Our rulebook needs an appeal so that it isn’t just about understanding how the game works. It will need clear visuals of the cards and setup along with clear language about mechanics. It wouldn’t help putting in some flavor to get the theme across, either. As soon as we get this done, we won’t have to worry as much when start blind playtests. Phil, Cindy, and I are still here, I promise you. We’ve been working on the game as best we can. What really helped us came from Phil’s two trips to the table-top gaming con Mecca known as Gen Con. And they have been very important trips to the game’s development. When Phil took the game to Gen Con 2015, it was very different. 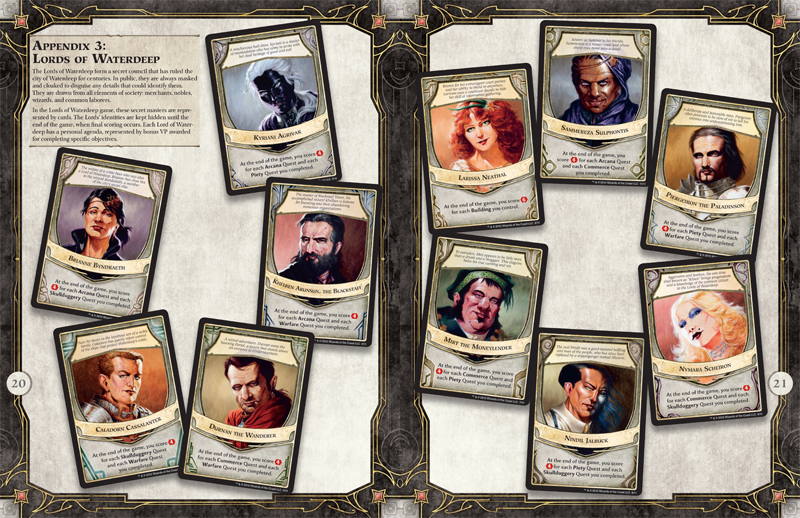 The 2015 version of the game had Influence cards, which players could use to draw cards, gain points, etc. At that point, Phil considered the game completed. There was some complexity to it, but it had solid mechanics that let you do interesting things once you figured it out. He presented the game to some designers at the Game Crafter Community Game Night (they’re the ones that print our game). It was there where fellow designer Andrew Voigt – designer of Perspective – delivered the strongest criticism about the game it had ever received. “If I went over to a friends house and they asked me to play this game, and after we were done they asked “do you want to play again?”, I would say “no thank you”. Phil said it hit him so hard that he still remembers it. Andrew explained it further.There was too much decision space in the game. All the choices and different directions that find the best way to win were mentally draining. The game was overloaded with effects, most of it coming from the Influence cards. After the criticism, the options were to either accept the game as is or do some major fixing. That very night at the hotel Phil started working (with Emma‘s help) on making the game a simpler one. The focus was finding what were the key interactions of the game – and cutting out the ones that weren’t. We cut Influence and Cultures as cards from the game.We are now using the word “Influence” to mean victory point. Cultures are now just a flavorful aesthetic for your cult. Shrines are now part of a player’s starting setup and are the focal points for interactions. Followers are now the main currency of the game. You work to attract and use them to “power” your actions. Relics are the only way you can score points now, so you need to interact with them to win. They are now center stage in terms of the game theme as well. The game now now has a much more simple core gameplay loop Now that the heart of the game centers on three types of cards instead of five, it’s more accessible. What Happened One Year Later? This year at Gen Con 2016 Phil had playtests with this leaner version of our game, and the reports are that it went well. Two of the groups managed to get through two full games. One three-player group got it done under 30 minutes, which is awesome. There is some confusion and/or loopholes on some of the cards. They aren’t major but they need to be fixed for clarity and to plug any exploits. We’ve still had issues with a tiebreaker option. Phil asked the groups that played for good ideas on a tiebreaker, and he thinks he has figured it out. One game had a problem where a player was essentially eliminated from play because they did not attract enough followers. This might turn off new players, so Phil has a potential fix for that as well. Everyone loves the art and the flavor. The game description was appealing and drew people to come play it. The most important aspect of this feedback is that it’s coming from regular players. The help of other designers has been essential to getting the game this far. However, game designers are always looking to give you feedback and they aren’t always interested in the kind of game you’re making. This event was nice because the people who played chose to play it. In the end, you can’t beat the satisfaction of watching people enjoy your game and have fun. It’s been quite a while since I’ve done one of these. The game has gone through some dramatic changes over the past few months. I took a look through some of the past posts to get a sense of where the game was when last we spoke. I was amused to find how many of the innovations we’ve had over the course of development have also been discarded for something better. We’ve really come a long way with this game and we have learned a lot. So let’s talk a bit about what we have learned this time around. Back around October of last year the game was feeling bloated and overly complex. We fell into this trap of adding a new mechanic every time we discovered a new problem. Games would drag on and turns were way too long. Playtesters would often give the suggestion of limiting the number of things that could be done during a turn. I had overlooked this feedback for a long time, since it would be a major change and I had no idea how to implement it without breaking the game. I eventually became so dissatisfied with where the game was at that I took the game back to a more early stage prototype using index cards. From there it was easier to try out some of these suggestions and build the game back up. We boiled the game down to the core fun mechanics and took the knife to anything superfluous. Let’s talk about what’s changed. One of the main goals was to speed up turns so that all players would remain engaged throughout the game. The plan was to do this through some sort of limit on actions per turn. However, I didn’t want to simply dole out action points. I wanted this limitation to feel more natural and be part of the mechanics of the game. Our solution was to simplify the relative value of Influence cards, so that the number of cards in your hand represented the number of actions you could take. All actions now cost 1 Influence to perform. Alternatively, you can discard an Influence card to perform the action written on the card. During your turn, actions you take will sometimes reward you with Influence that can be spent next turn, up to a maximum of 5. This creates a soft limit of 5 actions per turn, but is based on what the player does during the game. I find this system much more natural and easier to explain. Another goal was to make the game simpler to explain. I wanted to reduce the amount of effort a player would have to take in order for the rules to click with them. With that goal in mind, we removed the capacity mechanic from Shrines. Instead of requiring a certain number of Followers before the Shrine would activate, Shrine effects are now triggered based on player actions. For instance, a Shrine may now do something when a Follower enters it or provide some passive benefit to the player as long as there are 2 Followers in it. Doing it this way allows the card to completely explain how it functions and reduces the reliance on the rulebook to explain how cards interact with each other. It has the added benefit of simplifying the visual design of the card, while allowing more interesting mechanics. We had another win for simplicity by eliminating the concept of Missionaries. Followers had this dual state system where they started as Followers and became Missionaries. As Missionaries, they remained as part of your tableau and provided you benefits. We liked the idea thematically, but we always found it challenging to get people to understand how the mechanic worked. Now Followers are simply able to be sent on a mission. Doing so costs 1 Influence and requires you to discard the Follower. The Follower card describes the benefit you receive when you send them on a mission. Something I think our game has been historically bad at has been respecting the amount of space the game requires to play and how complex it is to set up. A more complicated initial setup often means an equally complicated storage system, both of which just create barriers. How much more likely is it that someone will play your game if it only takes 1 minute to set up and play? With this question in mind we merged all the core cards into 2 decks – one deck for Influence, and one for Followers, Relics, and Shrines. This greatly simplified the play space and setup. There are some downsides to doing this, such as making draws less predictable. We combated this by adding some cards that enabled players to manage the card pool and find the cards they needed. Ultimately though, our thinking came down to the type of game we are trying to make. Are we OK with the game being less about predictability and fairness for the sake of simplicity? I think a lot of the mistakes we have made over the course of development have been a result of too great a focus on fairness and not enough focus on fun. The recent changes have been a big course correction in that regard. So where does that leave us? The game rules are quicker to explain. It’s easier to setup and takes less time to play. There are less components and there have been lots of quality of life improvements for the player across the board. Those all feel like huge wins to me. Also, have you seen the art lately? It looks amazing! Revamped Designs Means Revamped Cards! We’ve been working on major changes to the game in the months since our last post. Phil made great strides on the mechanics from playtests. His updates meant there was a need for new changes in the card design, and Cindy delivered. Here is a preview of the new deck design. The deck is neatly divided by the colors of the back of the cards. The backgrounds and back of cards all have a weathered aesthetic to fit the theme and Cindy’s art. Here is the before and after of one of the Influence Cards, Revisionism. You can see the changes in font, icons, background color, and size of the text boxes. The overall dark tone of the new card helps push the dirty look we are looking for. It works great with the Follower and Shrine cards. While they’re not include in these photos, I had some updates of my own. Since the design changes also affected the Culture cards, I made sure that those made sense thematically. Those were rewritten as well. Stadium, one of the Shrines, also needed a flavor text change since Phil made extensive switches on it. I also fixed the title of a Relic that’s been bothering me since I got on this project. There’s the matter of one more major change left. The three of us would like to change the name of the game – the more we’ve pitched the game to others the more we’ve come to the conclusion there’s a better name we can use. When the time comes, we will release that as well. Hope you enjoyed the update! Grows, but will it one day be put asunder?